After a two-year investigation, Peabody Energy Corporation (Peabody) has agreed to revise financial disclosures to accurately represent known risks climate change poses to its business. 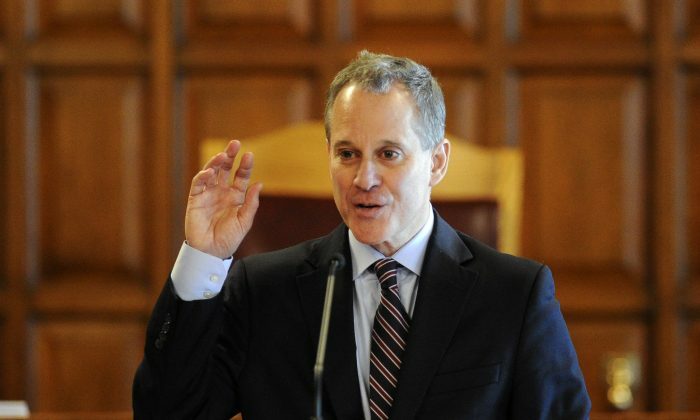 In what’s called a “first-of-its-kind” investigation, New York Attorney General Eric Schneiderman accused the world’s largest publicly traded coal company of violating New York laws that prohibit false and misleading conduct in the company’s financial statements. “As a publicly traded company whose core business generates massive amounts of carbon emissions, Peabody Energy has a responsibility to be honest with its investors and the public about the risks posed by climate change, now and in the future,” Schneiderman said in a statement on Nov. 9. Through its subsidiaries, Peabody has majority interests in 26 coal operations located throughout all major U.S. coal-producing regions and in Australia. The company reports revenues totaling $6.79 billion. As part of the agreement, which does not include an admission or denial of wrongdoing, the energy giant will amend shareholder disclosures with the Securities and Exchange Commission to accurately represent known risks. The company said in a statement that it has “always sought to make appropriate disclosures.” But according to Schneiderman’s office, Peabody repeatedly denied in public filings that it could predict the impact that future regulation of climate change pollution would have on its business, while internally, the company predicted severe impacts. For example, Peabody analysts apparently predicted that aggressive regulation on existing power plants would reduce the dollar value of coal sales in U.S. markets by at least 33 percent. Peabody has been one of the most vocal companies worldwide in advocating for clean coal technologies, and has been involved in major global initiatives to reduce carbon emissions for nearly two decades, according to its statement. The agreement comes four days after Schneiderman opened a similar investigation into Exxon Mobil. Schneiderman’s office subpoenaed Texas-based Exxon Mobil late Nov. 4, seeking statements, emails, financial records, and other documents that might reveal the company lied about the effects of global warming. Kenneth P. Cohen, vice president for public affairs at Exxon Mobil, told the New York Times on Nov. 5 that the company had received the subpoena and was still deciding how to respond. But he also noted that the company had funded mainstream climate science since the 1970s, published dozens of scientific papers on the topic, and had disclosed climate risks to investors. Peabody Energy Corp., the world’s largest private sector coal company says the Clean Power Plan won’t achieve our environmental goals.